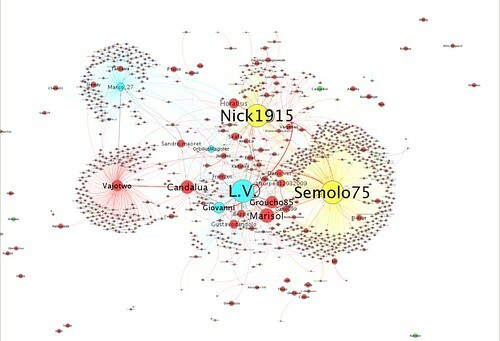 Reference paper: Social networks of Wikipedia. Massa, Paolo (2011). ACM Hypertext 2011: 22nd ACM Conference on Hypertext and Hypermedia. graph_analysis.py: reports various Social Network Analysis indexes about a networks such as number of nodes, number of edges, indegrees and outdegrees (mean, sd, 5 max values), density, reciprocity, transitivity, mean distance, efficiency, centrality (computed with pagerank, betweenness, degree centrality). It can also reports these indexes for subgroups of nodes (for example for admins, bots or anonymous users in Wikipedia). It can also consider only edges inserted before and/or after a certain date, in order to conduct longitudinal analysis. Networks are in graphml format. Right-click for downloading the desired file and then open it with your preferred program to analyze networks. We like Gephi. vecwiki-20091230-manual-coding.graphml: network of conversations on User Talk pages in Venetian Wikipedia, as extracted from the manual coding of each page. Pages were analyzed as they were on 2009-12-30.
vecwiki-20091230-signature-algorithm.graphml: network of conversations on User Talk pages in Venetian Wikipedia as extracted from pages-meta-current XML dump (see below) by looking for signatures (algorithm "signature" above). The processed dump contained the situation of User Talk pages on 2009-12-30.
vecwiki-20091230-history-algorithm.graphml: network of conversations on User T alk pages in Venetian Wikipedia as extracted from stub-meta-history by looking at editors of User Talk pages (algorithm "history" above). The processed dump contained all edits made up to 2010-06-29 but, in processing it, only edits up to 2009-12-30 were considered (algorithm "history" has a parameter by which you can specify the last date to be considered for edits).